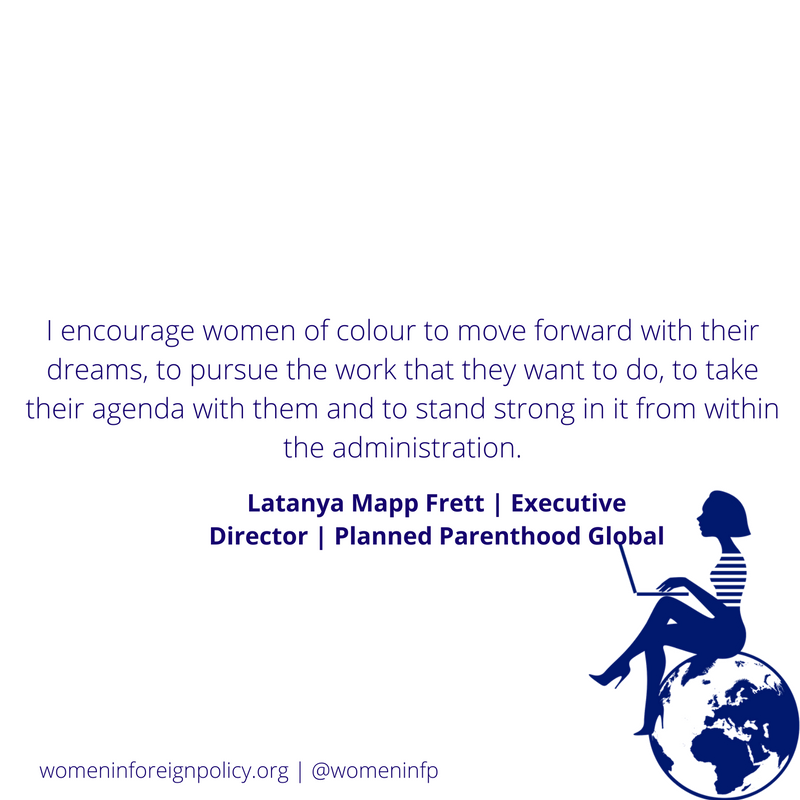 Can you tell us a bit more about what you do as executive director for Planned Parenthood Global? I've been the Executive Director of Planned Parenthood Global, which is the international division of the Planned Parenthood Federation of America. We are also the United States member for the International Planned Parenthood Federation. That's a lot of alphabets, but ultimately, what it means is that I hold a dual role here at Planned Parenthood. I'm based out of New York City and I run all of the international programmes for the organisation which, in this decade, has been primarily focused on working with and trying to help build the capacity of reproductive health organisations - both service delivery, (meaning clinics and community-based distribution of family planning), as well as advocacy, which is a coalition of community-based memberships who want to lift their voices around the issues of reproductive health. Both service delivery and advocacy programmes are in 12 countries in Africa and Latin America and they make up the Planned Parenthood Global programme. I'm also the vice-president of PPFA, and I am the international representative for that organisation. You've been at Planned Parenthood for about five years now. Why did you decide to join? It will be 5 years in February. There were a couple things going on for me. I've always been an incredible supporter of reproductive health programming. I’ve managed such USAID programmes in five countries. I've been very familiar with making sure that women have the opportunities and choices around reproductive health. The ability to decide if, when, and how many children that you want is the cornerstone of all of the work that we have been doing around education, economic growth, agriculture, and even democracy and culture in some of the countries where I have worked. For a woman to be able to participate in society as a young girl and when she grows into adulthood, it is very important to make sure that she has the resources to control her own fertility at her disposal. I was able to see this first-hand in all of the programmes that I managed when I worked both at USAID and at the UN. I was evacuated from Egypt during the Arab Spring, so I came back to the United States to see if there were any opportunities where I could really hone in on this field. I met Cecile Richards [President of the Planned Parenthood Federation of America] and I met the board of the organisation. The programme was fledgling. I had this opportunity to help it grow. I've been blessed to see it blossom and to see us doing more work, more innovation around reproductive health, around working with young people, around bringing digital education to a broad set of actors in the field. Those are the things that made me want to come and do the things that I've been able to accomplish since I've been here. About 100. When I joined, we were right at about 30. Now, we're at 100 because we increased the size of our programmes, really focusing our models around young people programmes and youth delivery of services. A concept you're probably very familiar with is community health workers. We now have turned that concept around, and in the last decade, we really perfected the ability of young people to be community health workers specific to reproductive health. They're able to counsel their peers, deliver commodities to them, and refer them to clinical settings for family planning. It's called the Youth Peer Provider model. We've perfected a model on digital education where, for instance in Nigeria, we've set up both an online portal, as well as a mobile app for kids called the Subject Matter. They can go on it, they can get information, ask questions, and then make appointments at their closest clinics. It's been a lot of models that we've been able to build out over time to make up the team that we have now. What if our readers would like to join the team, what would be your advice? I would say start here in New York City, and we can refer them through PPFA. They should go to plannedparenthood.org/global, where they'll be able to find out what opportunities exist here in New York, DC, and Miami, or they can come directly to us and we'll be able to tell them about opportunities that exist in countries in Africa. You've also been a member of the Council on Foreign Relations. What did that entail? The council is a membership organisation that includes a lot of well-known dignitaries, practitioners, and academics in the foreign affairs space. It's such a useful opportunity to be able to join them at their meetings and at their various events, especially in New York City. I mean it's just such an array of personalities that come through the council. Being in that space allows an opportunity for us to talk about reproductive health, to talk about women and their opportunities and their choices. I feel like being there has been such a good opportunity for me to bring up certain subjects. I'll give you an example. When the “Let Girls Learn” programme began in the White House as an excellent to look at girls finishing schools around the world, they kept talking about the inability of girls to continue school because it was expensive, because they were getting married, and so many other things. I was there and had an opportunity to remind them, yes, that's true. All of that is true, but girls are also dropping out of schools because they're getting pregnant, not just in developing countries, but even here [in the United States] and in European countries. We can't forget that. If we want to address the opportunities for girls, we have to make sure then that we give them the resources to be able to continue in school. That's not just paying school fees, that's also giving them the opportunity and information around family planning. What's your biggest challenge in your job? I think right now it is that space that we talked about at the beginning, which is our political landscape. I think there's a certain privilege that comes with working when the administration is supportive of you. Even with Planned Parenthood, we've always had these fights on the Hill, but we knew that the administration was supportive of the work that we did, particularly the global health work we do around the world. Right now, the United States is one of the largest donors in global health, is an advocate in the international advocacy space, and it gives outright donations to work that's being done in developing countries around reproductive health, but we are concerned. We are concerned about leveraging. Even though we don't take US government money to do our work, (because we primarily work with the private sector and not the public sector), we are concerned that the leverage of what the public sector does, and what USAID and the US government has brought to this field might go away. That, for me, right now is a challenging situation because so much of what we plan strategically has been with the understanding that there will always be a supportive government around women's rights and around development in global health. Now, we're not so sure we'll have that. How do you plan to address it? We've been thinking about a lot of possibilities around really strengthening what structures are in place. What I mean by that is that over the last two administrations, both the Obama and even the Bush administration, there's been a lot of work to ensure that women's rights are a part of the overall development assistance programmes in the United States, and that the United States has been a huge champion in setting up structures and other international organisations around women's rights. We know that there are, for example, positions at the State Department that ensure that all foreign assistance that goes overseas with USAID has to go through a gender scope or gender lens. We think strongly, with the evidence that we have around reproductive health and family planning, that when you look through this gender lens, many programmes that we will initiate or take away during the next administration will be seen as inappropriate. We're really leaning on the fact that there are a lot of supportive practitioners in place and a lot of administrative policies that have been put on place already that probably won't be overturned and can become useful if there should be a tendency to cut out programmes that benefit women. The world has been great in thinking about how to not go backwards in these efforts. For sure, when we think about the Bush administration, we can take some lessons. When there was a cut to programmes or when the Global Gag Rule was reinstated, people supported us. We’ll need help to close some of the funding gaps, and we’ll also need a lot of advocacy. When I say advocacy, I know that there's always been strong international advocacy for many points of the world around women's rights and reproductive health. It has to be stronger. It has to be louder. It has to be more insistent. It has to be, in some cases, maybe even shaming if there is a tendency for the new administration to set us back. That's what I think the world is going to have to focus on in. It's going to have to focus on filling gaps in developing countries where governments are not going to be able to do things like pick up the price tag for buying commodities of family planning that the US has been supporting, but also this advocacy piece, and really not keeping quiet or not just thinking of it as another news day when there is horrible cuts that are affecting women around the world. What's your advice to a young woman who would like to pursue a similar career, when the next four years are promising to be challenging? I have worked under a Republican administration and that was some of my best work. I feel honestly and strongly that you need the people within in order to fight. You need a strong organisation outside, but you also need strong people inside government. I don't take that lightly when I say I think there's a lot that can happen from within. I don't believe that those of us that are fighting from the outside are going to be successful if we don't have strong advocates and strong partners inside the government. I don't think it much matters where the administration is. If you support the agenda, if you support the work, I would very much go forward. I left the UN under the Bush administration knowing that I was not necessarily in support of many of the policies there, but I do feel like, when I think about the work that I've done in PEPFAR, the work that I've done in many countries around the world, that I was much better suited inside the Government to be able to have some of the necessary conversations than I might have been from the outside. I encourage girls, and particularly women of colour, to move forward with their dreams and to go and pursue the work that they want to do and to take their agenda with them and to stand strong in it from within the administration. I say that about any organisation, not just government. I think if you find that there's an opportunity that suits you and you feel like your voice is going to help, then that's very much going to help the world and certainly help your career.